Today is my first entry into "Blooming Tuesday". 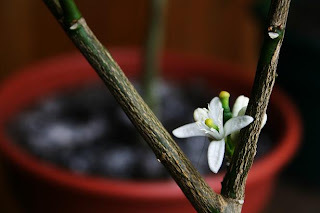 Click the flower above to be taken to the blog that hosts Blooming Tuesday. I was pleasantly surprised to see just how many plants we have in bloom right now. This morning felt like winter outside. We had snow and a low of 20 degrees, but its 100 degrees in the solarium and spring in the greenhouse. It's so neat being able to exist in three seasons all at once. 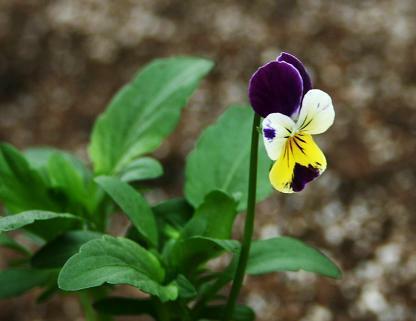 This viola was started from seed last fall and moved into the greenhouse over the winter. I attempted to kill it at one point when re-arranging beds in the greenhouse and preparing for new plants, but it didn't die. Now it's planted among the lettuce and arugula. I'm thinking we'll use the violas to garnish an upcoming salad. Aren't these flowers edible? Ahh, my tomato plants. I can't wait to be able to post pictures of these plants in a couple months for harvest monday. 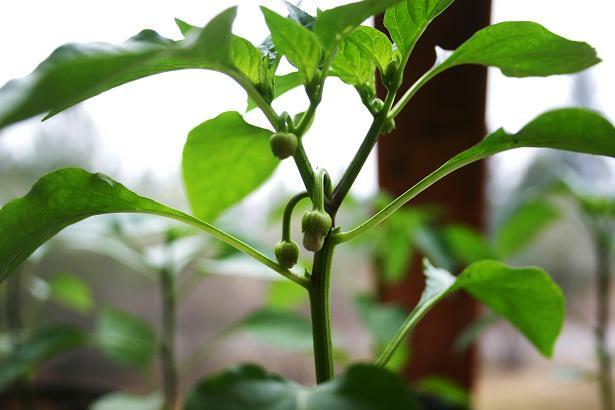 Maybe next week these jalapeno flowers will open. I think I'll still count these as blooms this week. 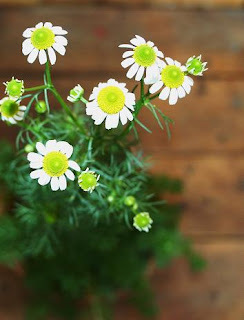 This is the best angle to photograph chamomile. If there is such a thing as an ugly plant, I think I might have to put chamomile in that category. I started this from seed last fall and have been growing it in the unheated solarium since then. Pretty soon I'll dry the flower heads, chop them up a bit and then use them when I make soap. I believe that this is our lime tree. Its doing well inside our solarium and starting to set pea-sized fruits. 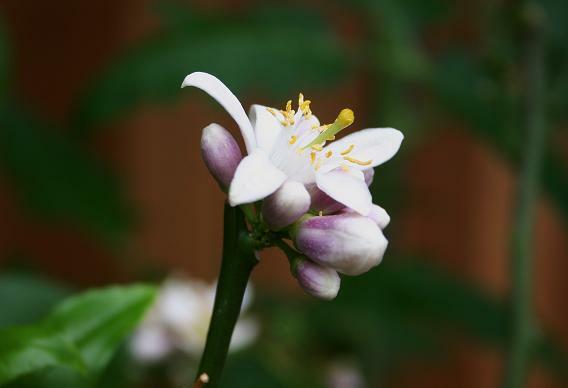 Another picture of one of our mystery citrus trees. In another few weeks, stop back in for some pictures of the indio mandarinquat tree in bloom. 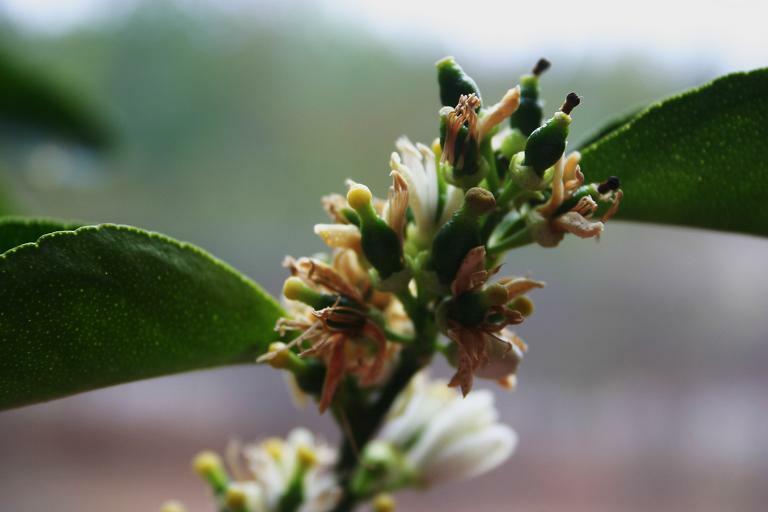 It's a bit behind the other citrus trees but will be bursting with flowers very soon. Have you tried growing her outdoors? I'm a bit further south from you but she turns into a magnificent 3 foot tall, big round ball of flowers in my gardens. What she lacks in looks she certainly makes up for with wonderful teas and shampoos. Anyhoo... just teasing a bit. Your photos are lovely. Happy bloom day! Oh Ilove your pictures and your solarium is amazing! I am in Idaho and we had snow too- a big storm huh! Kate - I guess I am being a bit harsh about the chamomile. I am going to grow more this summer outdoors, it will be interesting to see the difference! Paula - How about that snow, huh? We packed up all of our snowboarding and snowshoeing gear but might need to get it back out. I think the el nino influence is gone. Love what you have posted for Bloomin' Tuesday. I planted tomatoes last year and they are still full of tomatoes. Its the forever tomato plant! 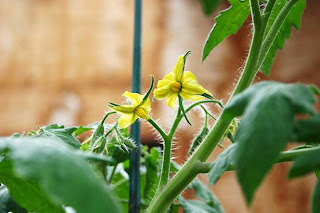 you have some wonderful things happening in your garden! Welcome to Bloomin' Tuesday! Very nice blooms! Your greenhouse plants are so impressive! Very pretty flowers, we just started some of our chamomile. Thanks for that link Mike! Looks like some good information.